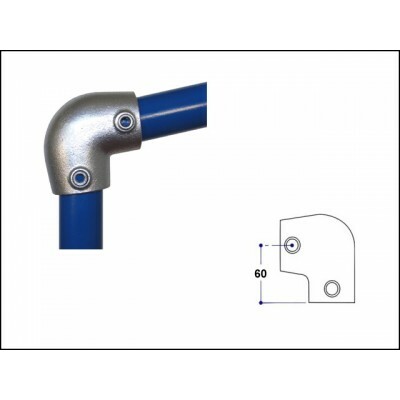 Angle elbow joint that?s adjustable for use on a sloping site from 0 degrees to 11 degrees. They are often used where the top rail meets the end upright and can be adjusted to suit a slight slope. Dimensions shown in image are in millimetres. This part is from the incredibly versatile range of galvanised malleable iron slip-on pipe and tube fittings produced by Interclamp. They allow for quick and easy construction of different types of structures with the use of a simple hexagon key, rather than any complicated fixings. Typically, these parts are used to construct hand rails and safety guardrails, but they are also suitable for a huge range of other structures such as playground equipment, shop fitting, sports practice nets, greenhouses, exhibition stands, wheelchair access ramps, and much more.